Cats aren’t the only pets who love fish, dogs love them too! 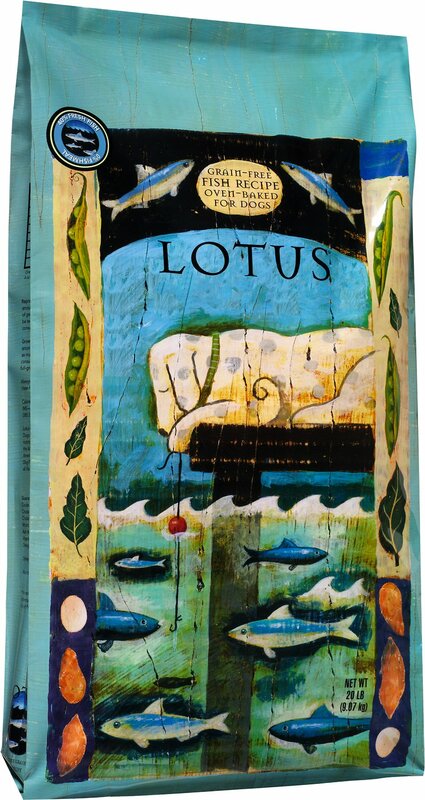 Lotus Oven-Baked Fish Grain-Free Dog Food combines real sardine and herring along with recognizable fruits and vegetables like dried peas, carrots, apples, spinach, blueberries and more. The beneficial blend of olive and salmon oils provides your pup with healthy omega fatty acids, while vitamins, antioxidants and nutrients help support her overall health. 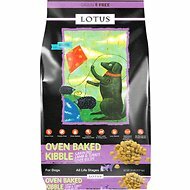 Plus, this kibble tastes just like an oven-baked fish cookie that your canine companion won’t be able to resist! 100% grain-free for sidekicks with sensitivities. 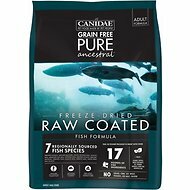 Features fresh fish as the only animal protein source, making it paw-fect for pups on a limited ingredient diet. Old Formulation: Sardine, Pollock, Dried Potato, Dried Peas, Dried Egg Product, Pea Fiber, Tapioca Flour, Organic Soybean Oil(Preserved with Mixed Tocopherols and Citric Acid) Brewers Dried Yeast, Dicalcium Phosphate, Sweet Potatoes, Monosodium Phosphate, Whole Ground Flaxseed, Calcium Carbonate, Sea Salt, Salmon Oil, Olive Oil, Carrots, Apples, Garlic, Spinach, Pumpkin, Blueberries, Dried Kelp, Zinc Proteinate, Iron Proteinate, Vitamin E Supplement, Copper Proteiante, Manganese Proteinate, Niacin, Sodium Selenite, Calcium Pantothenate, Inulin, Yucca Schidigera, Dried Lactobacillus Acidophilus Fermentation Solubles, Lactobacillus Lactis Fermentation Solubles and Lactobacillus Casei Fermentation Solubles, Folic Acid, Vitamin A Supplement, Riboflavin Supplement, Calcium Iodate, Vitamin B12 Supplement, Thiamine Mononitrate, Pyridoxine Hydrochloride, Vitamin D3 Supplement, Rosemary Extract. New Formulation: Sardine, Herring, Dried Potatoes, Dried Peas, Dried Egg Product, Pea Protein Concentrate, Pea Fiber, Cassava Flour, Catfish Oil (Preserved With Mixed Tocopherols And Citric Acid), Ground Flaxseed, Dicalcium Phosphate, Brewers Dried Yeast, Calcium Carbonate, Choline Chloride, Salmon Oil, Olive Oil, Carrots, Apples, Salt, Calcium Propionate, Monosodium Phosphate, Garlic, Dried Kelp, Spinach, Pumpkin, Blueberries, Zinc Proteinate, Iron Proteinate, Vitamin E Supplement, Copper Proteinate, Manganese Proteinate, Niacin, Vitamin A Supplement, Calcium Pantothenate, Inulin, Yucca Schidigera, Dried Lactobacillus acidophilus Fermentation Product, Riboflavin Supplement, Thiamine Mononitrate, Vitamin D3 Supplement, Vitamin B12 Supplement, Pyridoxine Hydrochloride, Calcium Iodate, Folic Acid, Sodium Selenite, Rosemary Extract. My rescue pup came to me with extensive fur loss and horrible itching. He's come a long way in 5 months, getting frequent compliments on how good his fur now looks. Part of this is due to his amazing food- Lotus Fish. My pup really does have a gorgeous, shiny thick coat. My dog loves the Lotus fish recipe. It’s a bit pricy so I usually get her the other recipes and get the fish recipe once in awhile. My dogs loved it. I just tried a small bag. It is two expensive because I have four big dogs. It doesn't have all the ingredients that my dogs need. I will stick with Gentle Giant. My three poodles love this food. I can even use it as training treats. 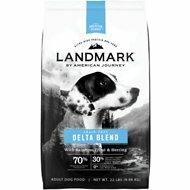 My English Golden Retriever loved it! My 3 years old English Golden Retriever eat different flavors of Acana/Orijen brand food before 2017 and he loved them very much. But we still want to find some other taste for him to try and he is enjoying this Lotus Oven-Baked Fish Recipe very much and I certainly will choose it along with Acana/Orijen for different taste! My 8 yr-old pit-mix loves this food. It smells good and isn't too oily. Will buy again. 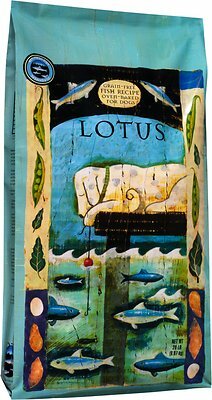 Lotus is a wonderful dog food. I have fed my dog all flavors but this one and decided to try. Especially since it has no meat meal. I prefer just whole meats. The fish is sourced from US wild caught sustainable sources. My dog loved it. I will definately get again. 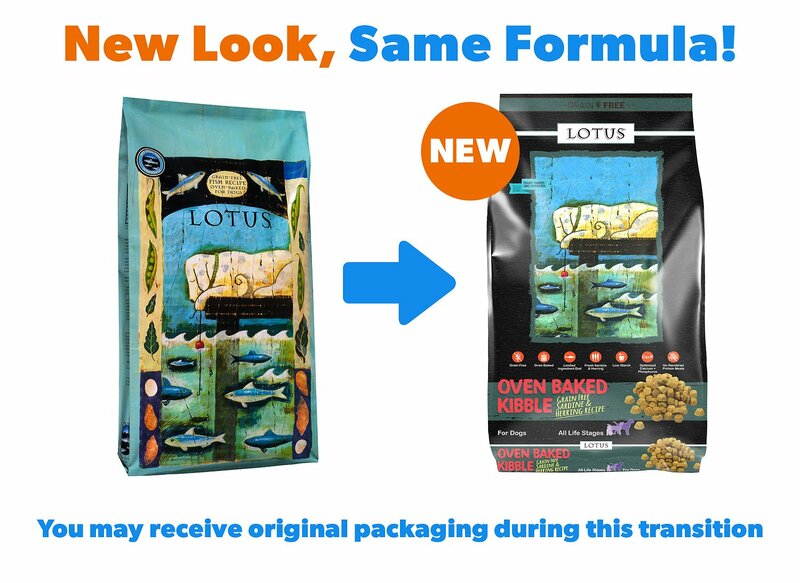 Lotus is baked not extruded. Also doesnt have any nasty enhancers sprayed on. Great quality food.